Depart our base, drive through the City of Roseau along the west coast then turning inland up the Imperial Road, through the Antrim Valley and along the lush and verdant south east road via Rosalie to Riviere Cirique, where the real adventure begins. 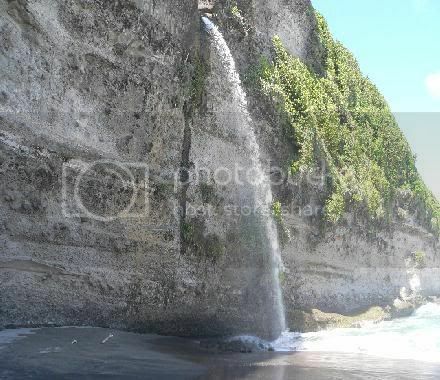 This activity is not for the feeble or persons afraid of heights, Aba Wavine is a dramatic and spectacular waterfall tumbling into the Atlantic Ocean. To get to the base of this waterfall, you must climb down a semi and sometimes vertical cliff, With the assistance of a rope and roots from trees growing on the face of the cliff. Extreme caution must be exercised, a firm and strong hold to the rope or root is imperative to your safety. Each step down must be planned and executed slowly with full knowledge of where you will be placing your foot. There are times when going slowly may be dangerous, this is not one of those times. You may sometimes feel your adrenaline competing with your fear as you make this audacious descent, an occasional glance upwards will remind you of the awesome power and force of nature so artfully encapsulated in the natural features of Dominica�s rugged topography. You will breathe a lot easier when you finally set foot on the black sand Atlantic beach, leading up to the waterfall. Going back up the cliff is more strenuous but less intimidating still the same level of caution must be exercised in the ascent. So you did it and the accomplishment feels great, now it is time to relax and enjoy a refreshing swim in the Roselie River before you return to base. KHATTS TOURS reserves the right to cancel any reservations for the Aba Wavine Adventure, due to bad weather conditions or if we feel that the persons participating may be incapable of doing the activity or may endanger themselves in the process of trying to do the activity because of their physical limitations. In the event that a cancellation was done due to any of the above mentioned conditions a full refund will be given.